FILE - Firefighters inspect the grounds after a fire at a storage site in Baghdad that housed the boxes from Iraq's May parliamentary election, Iraq, June 10, 2018. Shi'ite cleric Moqtada al-Sadr urged Iraqis on Monday to unite rather than squabble over a possible rerun of the election his bloc won last month, a message apparently meant to defuse political tension after a ballot box storage depot caught fire. Parliament has mandated a manual recount of the election in which a number of parties alleged fraud. A storage site holding half of Baghdad's ballot boxes went up in flames Sunday in what Prime Minister Haider al-Abadi denounced as a "plot to harm the nation and its democracy." An Iraqi court ordered the arrest of four people accused of setting fire to the storage site, state television reported. 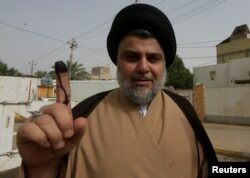 FILE - Iraqi Shi'ite cleric Moqtada al-Sadr shows his ink-stained finger after casting his vote at a polling station during the parliamentary election in Najaf, Iraq, May 12, 2018. "What Moqtada said about [Iraq] being close to some sort of armed conflict is concerning. The situation is tense and it seems to be on the brink of conflict," said Renad Mansour, research fellow at Chatham House in London. Sadr, a Shi'ite cleric who once led violent campaigns against the U.S. occupation that ended in 2011, has emerged as a nationalist opponent of powerful Shi'ite Muslim parties allied with neighboring Iran. "Stop fighting for seats, posts, gains, influence, power, and rulership," he wrote in an article published by his office. "Is it not time to stand as one for building and reconstruction, instead of burning ballot boxes or repeating elections just for one seat or two?" One of Sadr's top aides said on Sunday the fire was intended either to force a rerun of the election or to conceal fraud. The Supreme Federal Court is the only entity that has the right to decide on a repeat, not the government or parliament, Abadi's spokesman said Monday. A spokesman for Hadi al-Amiri, whose Fatih alliance of groups linked to pro-Iran Shi'ite militias came second in the election behind Sadr's bloc, said he did not favor a repeat. "The middle-of-the-road solution is a manual recount," said Karim al-Nuri, referring to the fraud allegations. Some of Iran's other supporters, such as former prime minister Nuri al-Maliki, whose bloc performed below expectations in the election, would benefit. At the same time, a recount might harm Iran in other ways. Tehran is accused by some parties in two provinces of helping a Kurdish party allied with it commit election fraud. FILE - An official carries a ballot box after a fire at a storage site in Baghdad that houses the boxes from Iraq's May parliamentary election, Iraq, June 10, 2018. "Iran would have preferred if Fatih and [Maliki's] State of Law [list] had done better than Sadr so any kind of redo where a different scenario comes out is better for Iran," said Mansour. "It is not an ideal situation for Iran and they might support a redo, but actually a recount might implicate them if the allegations in the north are correct." "We have checked our election device provided to Iraq after the fraud allegation erupted, and found out that there have been no malfunctions in the device nor its system," said a spokesman. The commission opposes the recount decision and has appealed against it but the judiciary has already started implementing parliament's measures, naming a new head for the commission from within its ranks Monday. "There is a lack of clarity as to who is in charge, what procedure is the legal procedure. Everyone is doing their own thing. The government institutions meant to monitor this process are neither independent nor powerful," said Mansour.